Pamplona is a city in Navarra, Spain. It is most famous world-wide for its San Fermín festival, held each year from July 6-14. San Fermín festival includes the legendary "Running of the Bulls", which features the daily bullrun or 'Encierro' in Spanish. Pamplona is a beautiful green city and ranks the highest in environment and recycling cities in Spain & Europe. 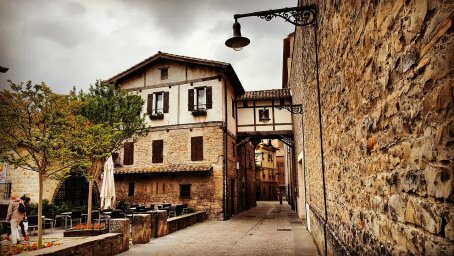 There are many interesting things to do and explore in Pamplona for a traveler as it is the first main city on the route of St. James (Camino de Santiago). It is a city with beautiful parks, historical buildings, medieval city walls and a river running through it too. The city is home of two universities, Public: Universidad Pública de Navarra & Private: Universidad de Navarra, and two campus´ located in different but close parts of the city.